It has been cold and rainy since Thursday. When I woke up Sunday morning, it was snow-raining. Ugh. Four hours later, at 11 am, it was still snow-raining. Big whine: but we’re in the second half of May! If I had been in a reasonable mood, I could have engaged in one of many entertaining and/or productive indoor activities but… I. Wanted. To. Go. Outside!!! Ducks don’t mind snow-rain so I headed to the pond by the Children’s Hospital, one of the best birding spots within a 30 minute walk of my home. When I got there, the male Red-winged Blackbirds were belting out their songs as usual and the 16 goslings and 4 Canada Goose parents were merrily eating grass. 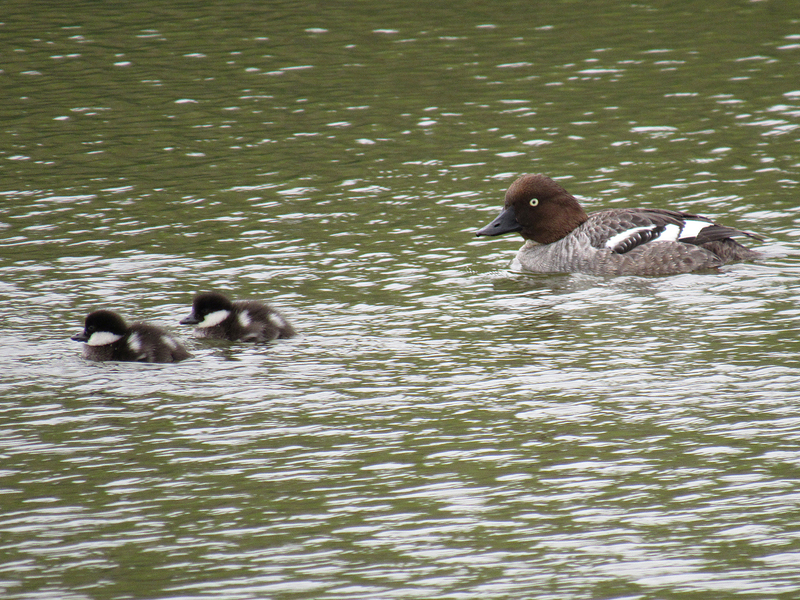 And a female Common Goldeneye was swimming and diving with a disorderly crew of little brown and white fluff-balls! The somewhat copious snow-rain had dissuaded me from bringing my camera, so I contented myself with simply watching the fluff-balls and other pond birds. My inclement weather mopiness dissipated and a sense of ease and joy took its place. A marvelous new bird flew out of some bushes and onto the pond’s little island. And an American Coot in the distance had a beak that was much too large. Could it be a…??? I was definitely coming back with my camera after lunch. The snow-rain had now turned to a gentle rain. I rushed home for lunch, hot chocolate and dry clothes. Around 2 pm, no concentric circles were forming in the street’s water puddles. Time to go back! On my return visit, I succeeded in photographing the ducklings, the marvelous bird and the “not-a-coot” and his brown mate. But this post is just about the ducklings and their mother. There were 7 ducklings. From behind, they remind me a bit of ladybugs. 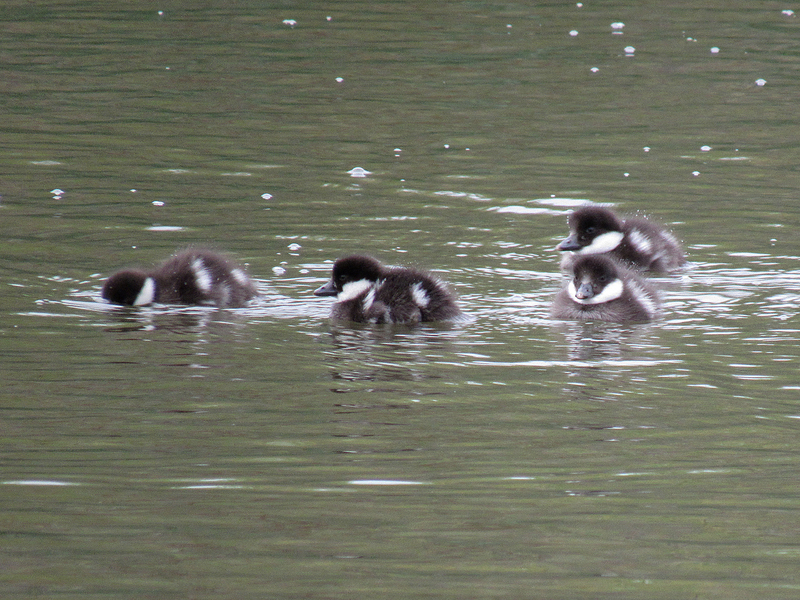 On both my visits, the Goldeneye mother and ducklings had the northeast side of the pond to themselves. The mother repeatedly dove under the surface in search of food. The ducklings fed by surface dabbling and occasionally dove underwater for about a second. According to Birds of North America, Common Goldeneyes are cavity nesters. They build nests in tree cavities. The male abandons the female 1 or 2 weeks after the start of incubation. The female incubates the eggs throughout the night but will leave the nest unattended to forage for food during the day. The number and duration of foraging trips varies – researchers have observed 1-7 daily trips with an average duration of 40-140 minutes. Incubation lasts about 30 days and the eggs hatch synchronously, usually within 12 hours. 24 to 36 hours after hatching, the young leave the nest. Their mother encourages them to jump and then they walk to a nearby body of water. After leaving nest, ducklings swim and feed with ease. Most feeding in first few days is by surface dabbling, but ducklings can dive within 1–2 d after leaving nest. Dives increase in duration and efficiency after the first week. These ducklings have been at the pond for less than a week. 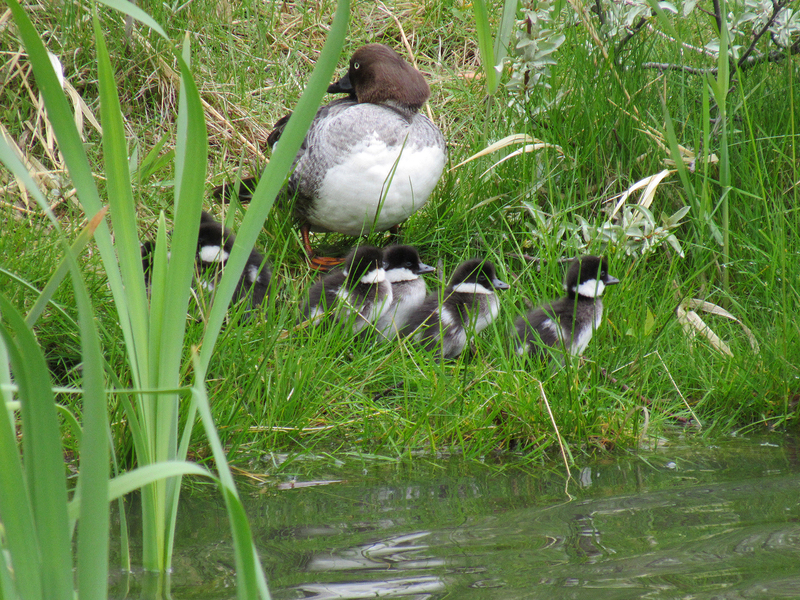 At some point, Mama Goldeneye decided it was time to go huddle on land. 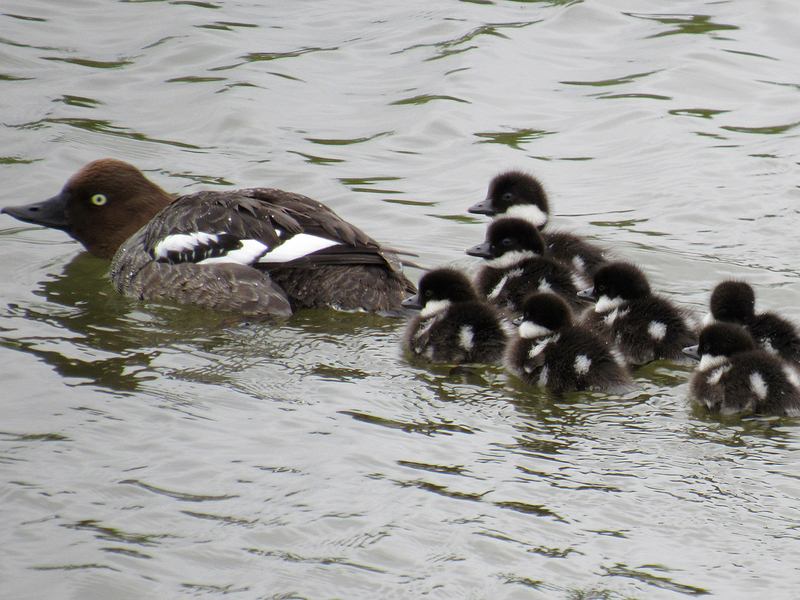 Common Goldeneye ducklings are quite independent. They require little direct care. Mothers brood their young at night or during inclement weather for about two weeks after hatching. They protect them from danger for 5 to 6 weeks and then abandon them before they are able to fly. 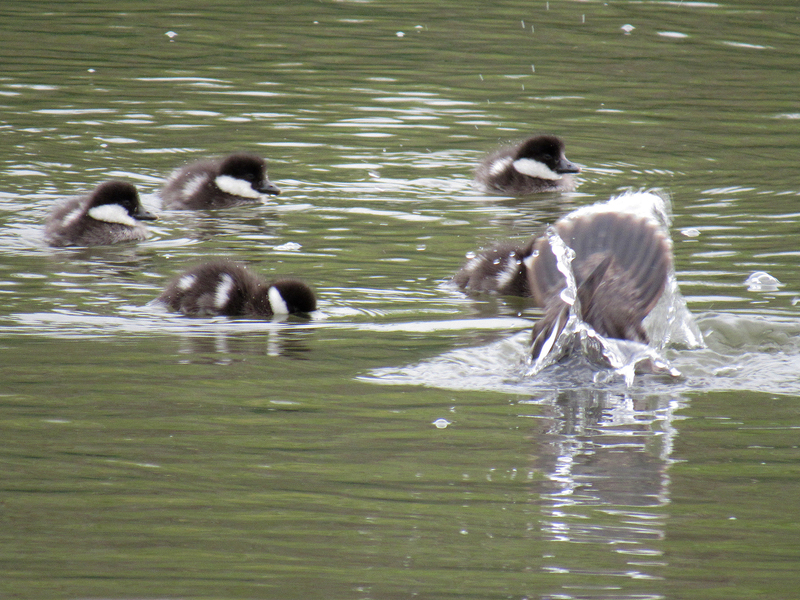 Young Goldeneyes can fly at 8 to 9 weeks of age. Occasionally, mothers abandon ducklings to another mother when they are younger than 5 weeks old. This usually happens when the mother loses a territorial dispute with another mother or when many of her ducklings die in their first week. Great photos and information on golden eyes. Thanks for sharing. Thanks, Lois :-). I’m glad you enjoyed the photos and information. I was curious about the ducklings dabbling behaviour and ended up reading a few things about them. That’s the cutest collection of photos ever!!! Thanks for your lovely comment and for visiting, Laura :-). I enjoyed discovering your plant and animal photos, and your drawings. Welcome Myriam, I’m so glad you came for a visit! I love your collection of photos and cant wait to explore some more. Thanks so much, Myriam — I so enjoyed your goldeneye adventures. Those ducklings are absolutely adorable!!! Thanks for your lovely comment, Jet :-). I’m so glad we get to share wildlife adventures. I find ducklings irresistible! So glad you went back. That’s a cute sight. Me too! Thanks for your sweet comment, Catherine :-). Glad you enjoyed the cuteness. I certainly did. Your story-telling is so descriptive I can see the day with my mind’s eye…fantastic! Cannot get over the cuteness factor, (better than a sugar rush), from the ladybug rear view to the fluff balls…your photographs are gems. 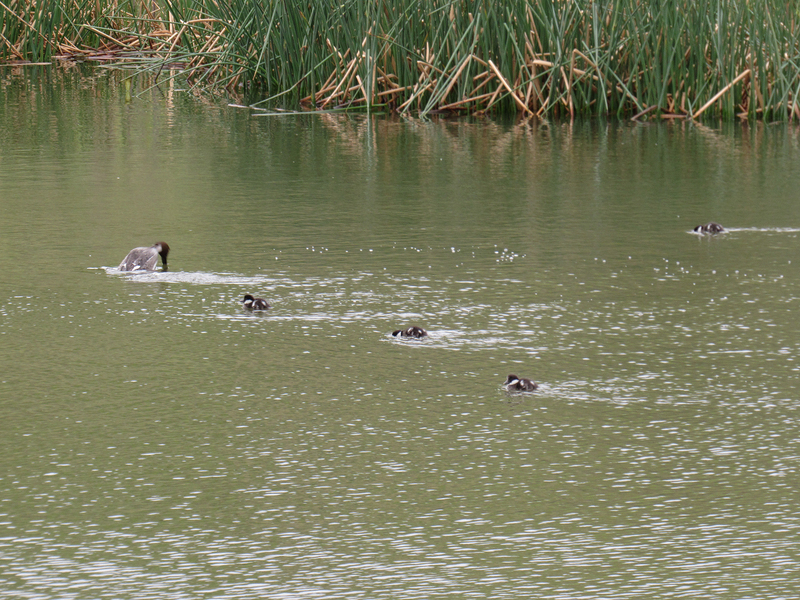 Oh, and the surface dabbling…looks like they are blowing bubbles in the pond….sooo cute. Looking forward to seeing what other discoveries you made on your visit to the pond. Thanks so much for your lovely comments, Haunani :-). I’m glad you could connect to the story and the fluff balls gave you a cuteness rush. Hopefully I will get around to posting some of my other discoveries – one of the new visitors is still around and the two others were there for just a day. Excellent captures, Myr. They are absolutely adorable! Thanks for your lovely comment, Eliza :-). Great pics and story. I’ve never seen baby Goldeneyes, they are so sweet! Thanks for your lovely comment, Tracey :-). I guess Common Goldeneyes don’t breed in or near Vancouver? 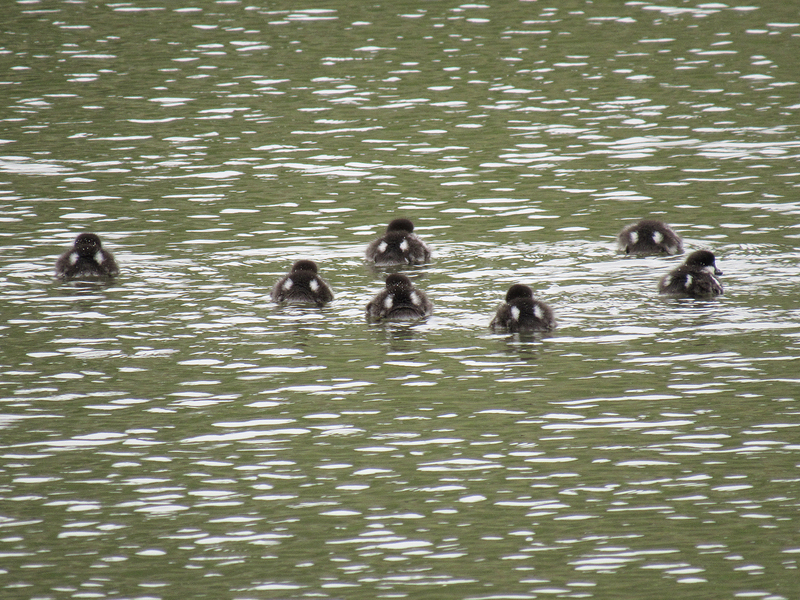 I remember seeing a lot of Barrow’s Goldeneyes near Stanley Park, but never ducklings. 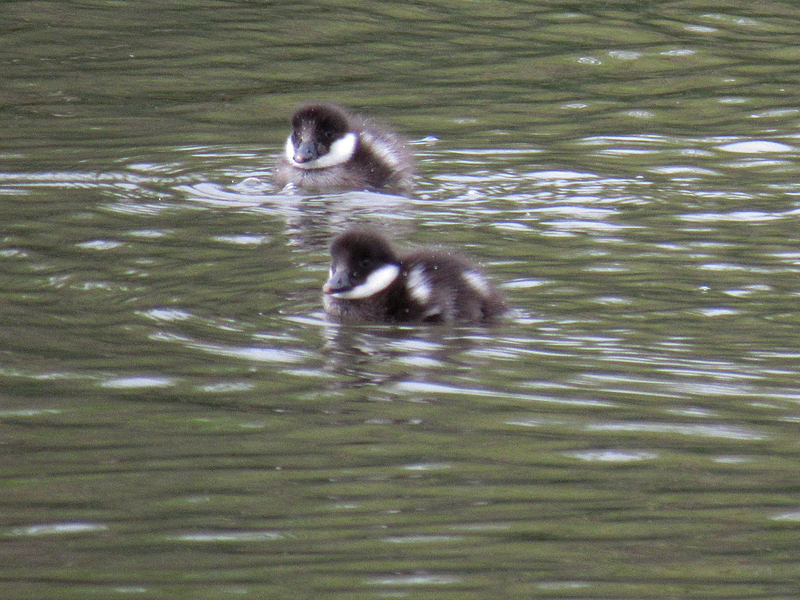 This was my first time seeing Goldeneye ducklings. A treat! LOVE this! They are so adorable. Oh, those are simply ADORABLE!! Loved your images and thanks for sharing!